There was a really good hard frost last night! so i was lying on a plank of wood in the freezing cold early this morning shooting these shots! lol Must be MAD! I Dont often get the chance to shoot them , so made the most of it! 521 frames shot in three freezing cold hours! eventually i could not feel fingers or toes! Haha. 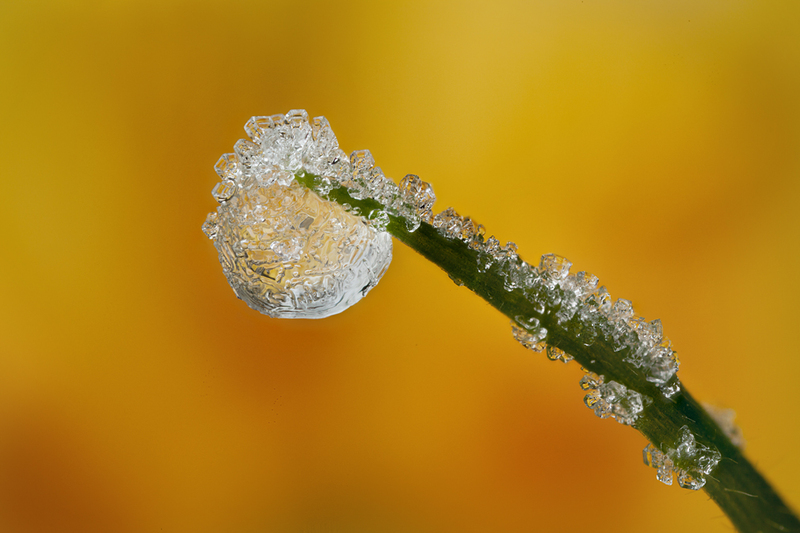 This is a focus stacked frozen dewdrop. 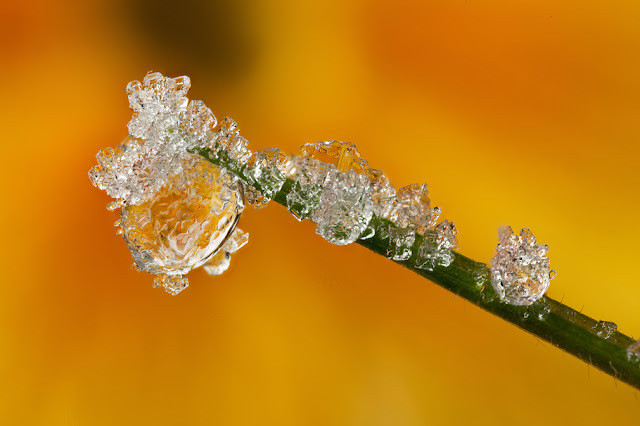 Dew forms naturally on the tips of blades of grass on cold nights after a warmish day. shot at x4 magnification with canon mpe-65 macro lens. the depth of field is so shallow at this high magnification that focus stacking is used to increase the dof to cover all parts of the frozen drop. 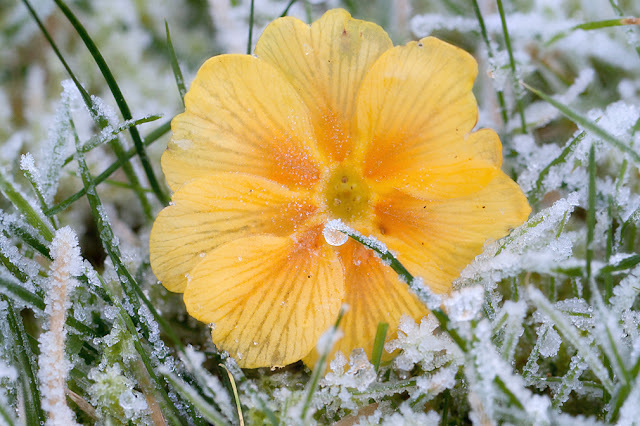 Once a good dewdrop has been located on the lawn, i then place a small flower,( a primula in this case ) just behind the flower to give background colour. in a non frozen dewdrop, the flowers image is refracted inside the water drop. 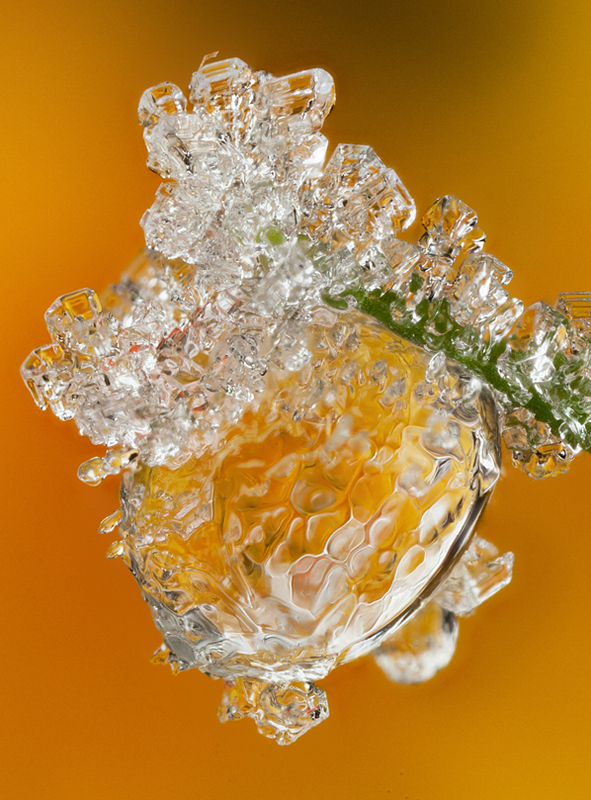 moving the flower back/forward will alter its position in the water drop , so can be moved slightly to give the best resulting image inside the drop. 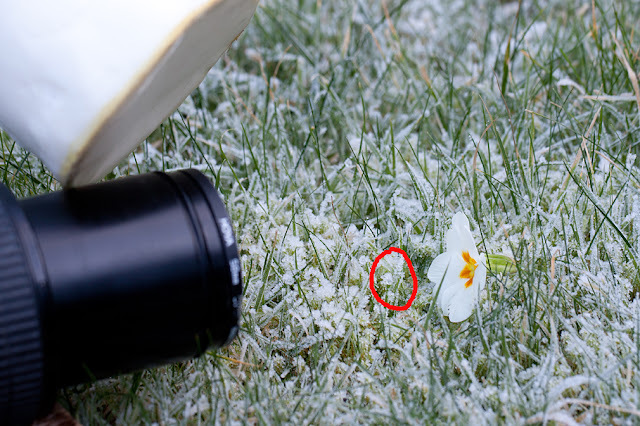 Here you can see how close the flower and drop are to each other, and the approximate angle position of the mpe lens when shooting. i use a large plank of wood to lie on ,and rest lens barrel on left hand to keep stable! a series of frames are then shot , each with a slightly different focal point until all parts of the subject have been shot in focus. typically 8-14 frames at f7 should do, i align one of the crosshairs in the viewfinder to a noticeable part of the drop so i can keep all the frames fairly well aligned when shooting. Here is the flower/drop used for this sequence of shots. Here are 4 of the individual frames , i used 8 in the final image. you can see in each frame the slight differences in focus point. 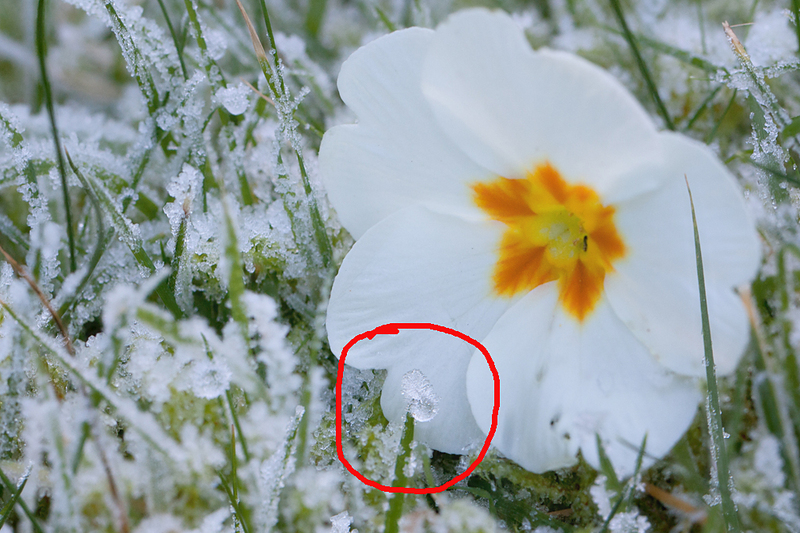 the focus point in the next 2 frames was very slightly different on the main frosted drop. 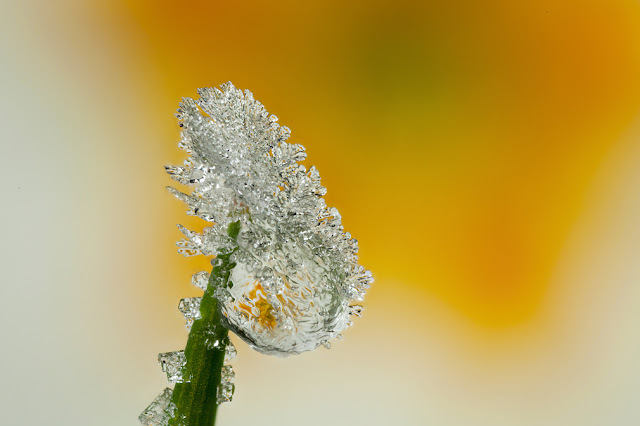 All 8 individual images are then stacked in "zerene stacker" to produce the final image, with significantly greater depth of field than a single shot could produce at this magnification. 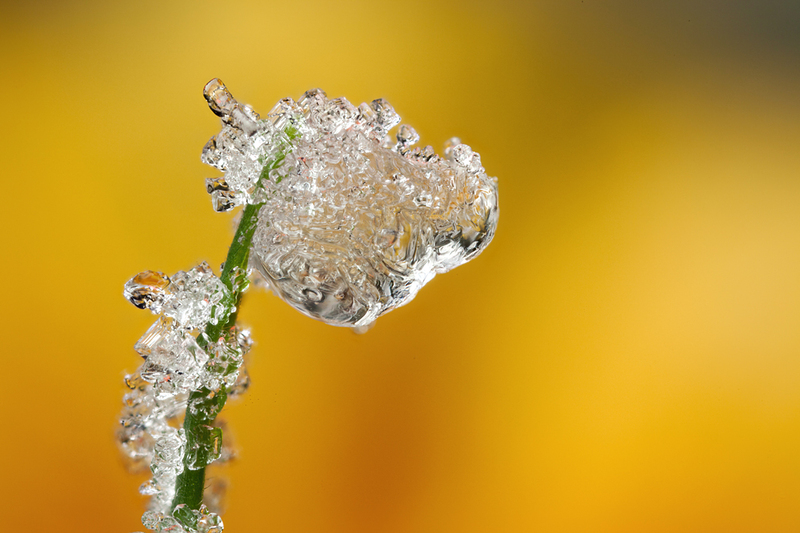 I shot 11 frames , but chose to leave out 3 so the image has a natural dof, with the lower blade of grass out of focus. a crop from above shot! I will post the best shots from today in next blog! shot after i had warmed up a bit!! 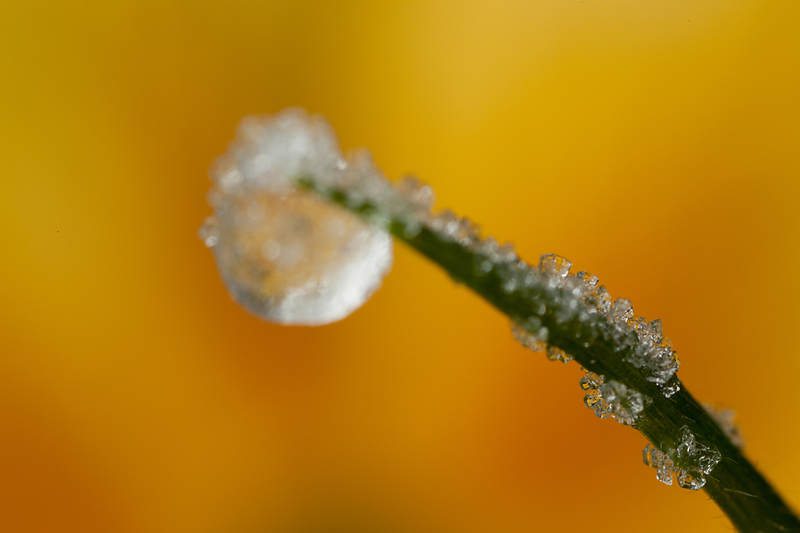 all shots taken with canon 5d2 and mpe-65 macro lens. Very nice, thanks for the tips. Beautiful - and instructional. Thank you. Around here it is MUCH too cold to be laying on the ground. Yesterday's ambient temperature was -19C and, once you factor in the windchill, it was equivalent to -27C (or, for those south of the 49th parallel in NA, that's -16F). In other words - beyond cold! Nicely taken images and thanks for the "Frozen Dewdrop Tutorial"
I guess I need some software now. Well done Phil,excellent tutorial,i see you use a 5d to shoot with,is this better? 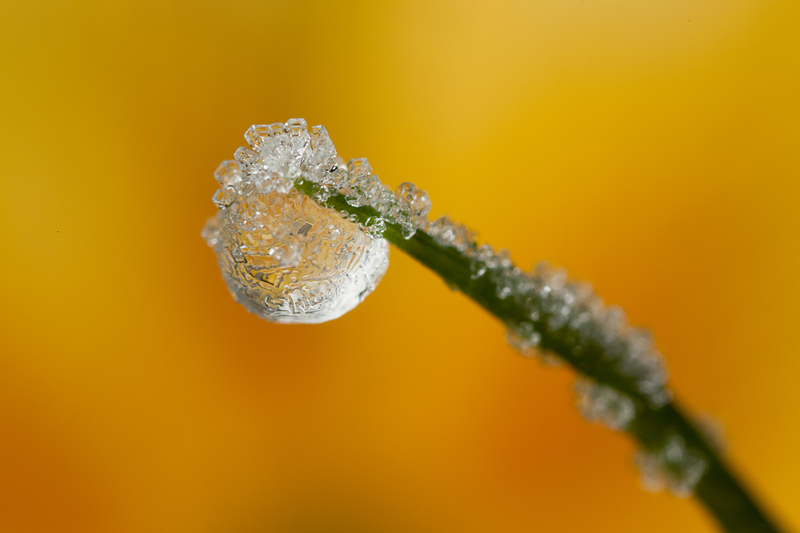 or is a crop body,7d or like better for macro? No definitive answer but with a standard 1:1 macro lens I tend to shoot on a crop body but with an MPE-65 1to 5X macro lens I shoot on a FF body. Cheers Brian,i had a go yesterday with my mpe but really struggled,anything i tried above 1-1 went in the bin, maybe as i was trying to get closeups of bees in a bush,i kept hitting the bush with my flash and scared them away lol. Actively feeding bees are just about the hardest subject to try ! New extreme macro site at http://extreme-macro.co.uk/ - why not try extreme macro for yourself? The shots look great by the way.